Welcome to our Miscellany page, containing a potpourri of interesting odds and ends. When I was a kid in the 1950’s, Dad always used a shaving brush, shaving cup and shaving soap to work up a hot lather. I never asked him anything about this ritual because I’d seen it all on Gunsmoke and the other old-time TV shows. There was a quaint old custom that obviously went out of fashion in the 19th century. I used sensible twentieth century shaving aerosols. In January 1970 Gillette’s patent registration for “The Hot One” was accepted. That was a chemically-driven foam that became hot when dispensed. It used hydrogen peroxide to generate the reaction. I adopted it immediately, but I noted the foam only stayed hot for about fifteen seconds, after which it became just another shaving cream. As I recall, that product was pulled from the market after about a year due to skin reactions reported by some users. After that, I went back to various popular brands of foam shaving aerosols for a number of decades. Researching this post, I’m reminded what a huge market for men’s shaving products there is. There are articles on hot shave dispensers, how to shave with a straight razor, and even on individual brands of shaving cream. 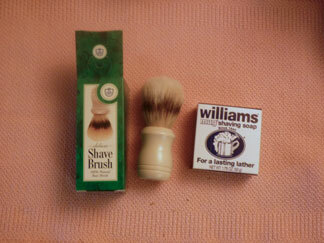 In the 1990’s I discovered you could still buy a shaving brush like my dad’s, and I bought one. I used that pretty regularly for the remainder of my working career. One can buy a “shaving cup,” but I generally just use a heavy wide-brimmed coffee cup of the sort used for soups. You can also recycle the bath soap chips you’d normally discard when they get down to a certain size, and I find so functional difference between that and a dedicated shaving soap. I’m not a purist for any one shaving method, and I keep an electric shaver around for a quick lazy retired man’s shave. I even keep a can of Burma Shave around. My shaving brush, rinsed in very hot water and then used to work up a good hot lather, softens the whiskers and prepares them for the shave better than any other method I’ve tried. I like the fact that I don’t have to rinse a load of excess shaving aerosol off my hands before I begin shaving. It’s still the smoothest, cleanest way I know of to shave. Dad was right after all! I was watching the BBC comedy show As Time Goes By. The girls were playing Monopoly. They were calling out the street names and they had them all wrong! I’d never heard of those places. No Boardwalk, Marvin Gardens or Park Place. On a hunch I checked it out in Wikipedia. 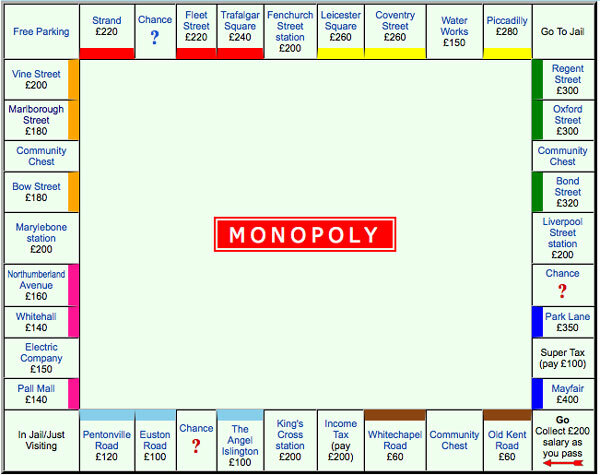 Sure enough, the British version uses British place names! Photo below is a screen capture from Wikipedia. A friend sent us the link to the US national repository for “heritage” music and early recordings — from the dawn of the recorded audio age. These Library of Congress recordings are generally all around 100 years old. They’ve been digitized – a massive undertaking, and, given their age and the sound quality of early recordings, a challenge. As you’d expect, this is really vintage stuff, but I doubt it can be found elsewhere in the public domain. The National Jukebox debuts featuring more than 10,000 78rpm disc sides issued by the Victor Talking Machine Company between 1900 and 1925. I still play Klondike Solitaire, but you’ll note there hasn’t been a peep out of me on this topic in almost two years. In my last 2009 post I noted that I’d achieved 50% win ratios but had then sunk back down to around 48%. That pattern has repeated itself several times since the 2009 post. I hit 50.4% today and had to check to confirm that’s a new personal record, though I’ve hit 50.3% at least twice before. It won’t last. I’d also written that I had a new article on Klondike [strategy] in the works, but that I was putting it on hold. Now I’m just going to put it on ice. The image below shows I’ve played over 3,000 games in the current “session” (and there have been others). So, if I’d been playing for a dollar a hand, I’d be about twelve bucks ahead. Not what you’d call a bell-ringer at the casinos. 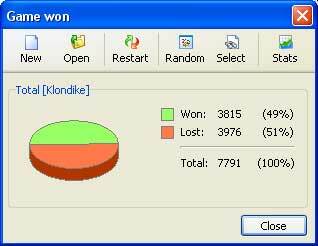 Based on my own long experience, it’s my personal belief that Klondike Solitaire odds are close to exactly 50% if you do everything perfectly. I’ve been playng Klondike for the better part of 10 years, and I started saving off results in 2007. It’s always the same old pattern. There is no mathematically possible way my current 50.4% win ratio has anything to do with a good luck streak or a bad luck streak someplace back in the past. If you start recording a new session, and win the first hand, that’s a 100% “win ratio” – but watch how fast it sinks back down to the same old 50% range! I read a short story in The New Yorker the other week where the author wrote that he plays marathon Solitaire – a lot of it, like me. To him, it’s not about winning an individual game. It’s about the thrill of getting on a roll and winning a streak of ten or twelve games in a row. It is all much like surfing the Sargasso Sea. Once in a while you’ll get to ride a few gentle swells that roll in from a thousand miles away. And then it is over and you are in the doldrums again. So it’s not about beating the house after all. It’s about relaxing, and maybe it’s about all the things you can think about while “wasting time,” like that book you’re trying to write. … and I have a major update wrapping up the wit and wisdom of my previous posts on Klondike Strategy. But that update has been gathering dust for months. I’m feeling rather humble about the whole thing. You see, I climbed to over 50% win ratio on that same long streak of games I’ve been accumulating for years. So, I reasoned, I must be doing way better than 50% in order to raise the long-term average that much. And, I started a brand-new game under a new user name. I haven’t been able to hit better than 48.3% since. I don’t know what the official record is for this game, if it exists, but 49% is a record for me. Our programmers have explained to me that it is possible to have only one decimal after the point, so the percetages [sic] have to rounded. Anyway, they know about your suggestion. Thank you! I’ve worked with programmers most of my working life, and this answer is of course balderdash, though (as I just explained) not entirely unexpected from the profession. If the higher score is “better”, and you only support one decimal place, the answer should be reported as 48.9% (truncate excess digits; don’t round up). 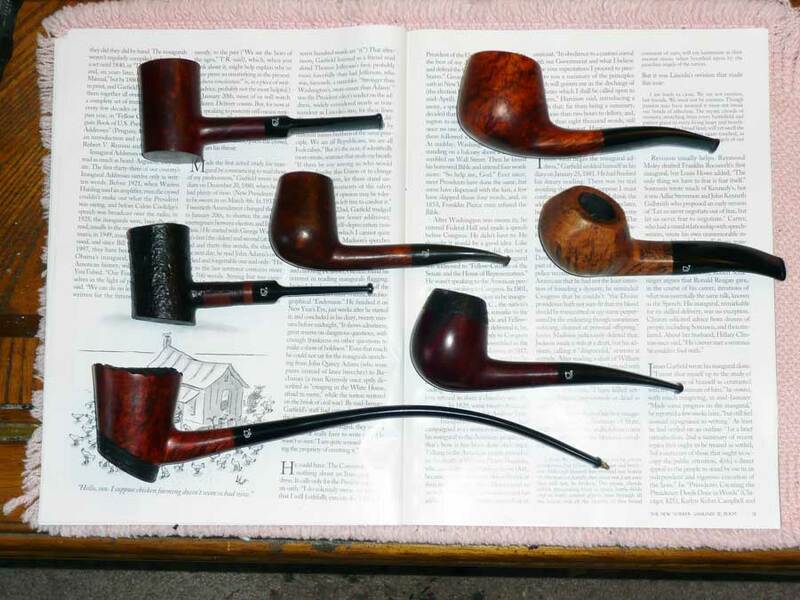 With the passing of great pipemaker Bjarne Nielsen in 2008, the family decided not to continue in the pipemaking business, and the last inventories were sold to distributors. Fortunately some nice models are still available. With the recent arrival of what may well be my last Bjarne (right center), I decided to take a family portrait. Some of this modest collection have already graced the pages of Miscellany. The two Pokers (left top and center), and the giant “sitter” churchwarden have become great smokers. Two newer thick-walled freehands (right top and center) are becoming all-time favorites, producing a cooler, more pleasant smoke than even my prized Nordings. The one factor I am seeing that best accounts for a good, cool smoke is bowl wall thickness. The two darker-finish pipes in the center are my “travel pipes” – lighter weight, thinner walls. It is more difficult to get them to produce a good smoke – though emptying a half-smoked pipe, when the shuttle bus arrives, is hardly a good way to break in a pipe or maintain good smokers. Leica C-LUX 2 mini digital … Click image for larger file. 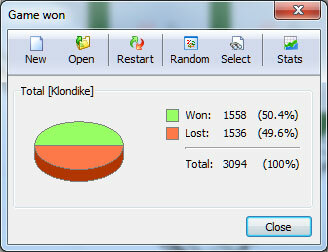 This Klondike win, with its new jump to 48.4% wins, was a long time in coming, but it was my fastest ever: 1.33 minutes. I slogged up through the wins by tenths from 47.7 to here, but it took over a month. As in the October Klondike post, I busted through a record and then fell back at every step. It takes patience – too much of it. My main strategy change is even more aggressive shuffling of cards from top to bottom, and vice-versa, to give myself every possible chance to promote just one extra card to the top foundation piles – while the iron is hot. “Aggressive” means: if you have a two of hearts burying its own ace at end of game, and if you can disassemble a couple of large stacks on the top foundation piles all the way down to the three of clubs, and play that deuce, you have another win. The alternative is saying you’re stuck and willing to lose the game.